We love 3D printing. It’s great for one-offs, or for small parts. But can it be just as great for furniture on a larger scale? Perhaps. 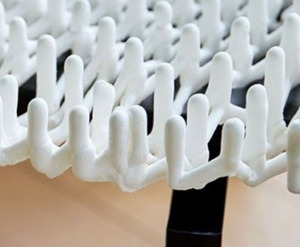 Scientists at the MIT self-assembly lab have collaborated with Steelcase and product designer Christophe Guberan on a process called “rapid liquid printing”, allowing larger objects to be printed in just minutes vs. lengthy (no pun intended) filament processes. Check it out @ Designboom.